Unlike blogger friends A.S.E., Petite Pacer and A Running Chick, who regularly do long distance training runs, I've seemed to settle into the 3 to 4 mile gully. This time last year I was gearing up for the LI Half Marathon and regularly running 8 to 12 mile weekend runs. With no half to prepare for in May, and a recent bout of pain around my hip, I've lost some critical base conditioning. I went out today determined to cover at least five miles and I managed to do that. Non-runners think that a long distance run would be hard, because they perceive the challenge as not "having enough wind." Runners know that the toughest part of a long run is battling both tedium and muscle fatigue. Let's face it, much of running is voluntarily suffering and while we've all found "the zone" at one point, most runs are teeth gritting experiences. Nature's way of getting us to keep doing it involves the release of endorphins at the end. This make us forget how much we hate running. I headed over to the local business park by way of a loop through the neighborhood. I'd forgotten to turn left into the middle school that has a passage to my planned destination. I ended up doubling back a bit, and taking the penalty of running up an unplanned span of inclined road. In the scheme of things, that mistake probably made it easier to achieve today's distance goal. 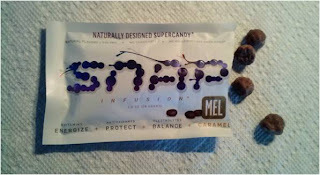 Before I left on my run, I tried a half portion of SNAP infusion "super candy" that was given to me by my friend KWL. I went out later than I expected and was feeling pangs of hunger as I prepared. This was due to only having a small breakfast hours earlier. SNAP contains a combination of antioxidants, electrolytes and carbs and the whole package (I had just half) is only 110 calories. I expected it to taste good, but this was legitimately great. Good enough to compete with real candy. It didn't occur to me until I'd reached the first half mile that my effortless running may have been enabled by the supplement. Despite forceful winds chilling the already cold air, I felt great, engaged and ready to cover more miles. I didn't work out yesterday (though I covered a lot of ground on foot) so perhaps that break from running helped me today. But the positive experience I had with SNAP made me want to try it again. I covered the business park and an adjacent neighborhood before turning back towards home. I enjoyed the run, but maybe I'm just brainwashed by the endorphin effect. I'll blame my middling performance on the combination of head-on winds and the hilly route around he park. No matter, I finally broke 5 miles for the first time since early March. Compared to the others, it's still not impressive distance, but it did push me out of my gully. Congrats on the five miler! I'm a big fan of shout outs!! Thank you. Thanks ASE. It's funny how speed work and distance runs can slip out of your training regimen when you're not targeting a specific race.